Great Lakes, Great Times, Great Parks…Great Hiking!  Michigan State Parks and Recreation Areas in Northern Michigan offer some of the best outdoor recreation opportunities in the Midwest. One of the most enjoyed activities is hiking, whether for exercise, nature observation or while on a backpacking trip.  Some of the best hiking opportunities exist in the Mackinaw City area south of the Bridge and once you cross into the Upper Peninsula. 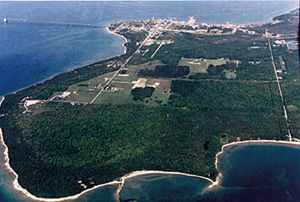 An Emmet County Park on the Straits of Mackinac. The Headlands property is made up of nearly 600 acres of forested lands, 4 miles of trails, and 2 miles of beautiful Lake Michigan shoreline. You will experience breathtaking sunsets, pristine lakeshores and natural surroundings full of wildlife. St. Helena’s Island, the Upper Peninsula of Michigan, the Mackinac Bridge, Waugoshance Point, Wilderness State Park, Cecil Bay and Trails End Bay are all visible from the shores of the Headlands. The Headlands has been painstakingly preserved by local residents and groups for your enjoyment. There are 140 miles of roads and trails on Mackinac Island with many of them designated for foot traffic only, as there are no motor vehicles allowed on the Island. The majority of them are paved roads that are shared by bicyclists, carriages and pedestrians. 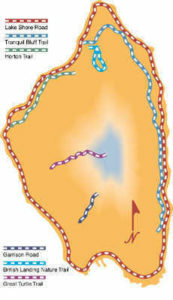 The longest walk is the “Round the Shore” trip. The round the shore is an 8.2 mile journey along Lake Shore Road. This route takes you by many natural features of the Island and shows off the breathtaking scenic shoreline. Mill Creek State Historic Park is situated on over 600 acres that contain beautiful forests, wildflowers, and scenic views, in addition to the reconstructed sawmill. 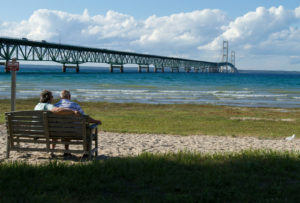 The park has 1.5 miles of trails including a half-mile nature trail that borders the creek and passes two scenic overlooks from where the Straits of Mackinac and Mackinac Island can be viewed. Departing from the nature trail is a mile long spur to a beaver pond. 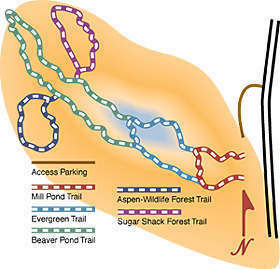 Interestingly enough, Mill Creek has a one of a kind mile loop nature trail that is totally handicap accessible. Wilderness State Park has 12 miles of designated foot trails that weave throughout the park. 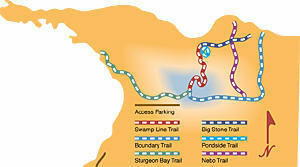 Marked trails include Sturgeon Bay Trail, Swamp Line, Boundary Trail, Nebo Trail, Pondside Trail, Red Pine Trail, Hemlock Trail and Big Stone Trail. Check with the DNR staff first, as parts of the shoreline are closed in the spring and early summer when the endangered Piping Plover is nesting. 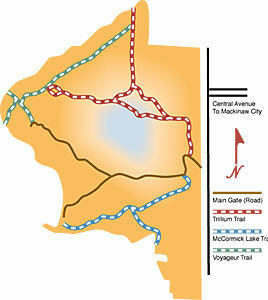 It is also suggested you request a complete hiking map to fully enjoy the sites and trails. This is a wonderful area to explore the ecosystem of the Great Lakes meeting the great hard woods of Northern Michigan.